CSF serves as a protective fluid to the brain and spinal cord, cushioning them from mechanical injury, and acts to reduce the brain’s effective weight—its actual mass is ~ 1500 g while the buoyancy provided by CSF reduces its net weight to 25–50 g . It serves as a critical mechanism for transporting nutrients and hormones from one area to another [3–5]. CSF also plays a role in protein clearance within the CNS by mechanisms hotly debated [6–9]. Reduced CSF secretion as a function of aging  contributes to increased protein aggregation and has links to increased beta-amyloid deposition in Alzheimer’s disease [10, 11] or phosphorylated tau protein in chronic traumatic encephalopathy . The exact mechanisms of CSF secretion, flow and reabsorption/drainage are debated; however, it is understood that alterations to normal physiology can contribute to elevated ICP. The traditional view of CSF drainage is that fluid flows from the subarachnoid space through the arachnoid villi and drains into the blood of the superior sagittal sinus (Fig. 1) . Studies conducted in multiple animal species also point to lymphatic drainage of CSF in which CSF exits the cranium through the cribriform plate and spinal canal to reach the cervical and spinal lymph nodes [14–18]. While there is debate about the dynamics of CSF, studies have attempted to elucidate how our current hypotheses of CSF physiology may be influenced by neurological disorders or injury. Factors influencing secretion, flow and drainage are under investigation and are relevant in conditions of elevated ICP, as CSF contributes to the overall pressure of the CNS. 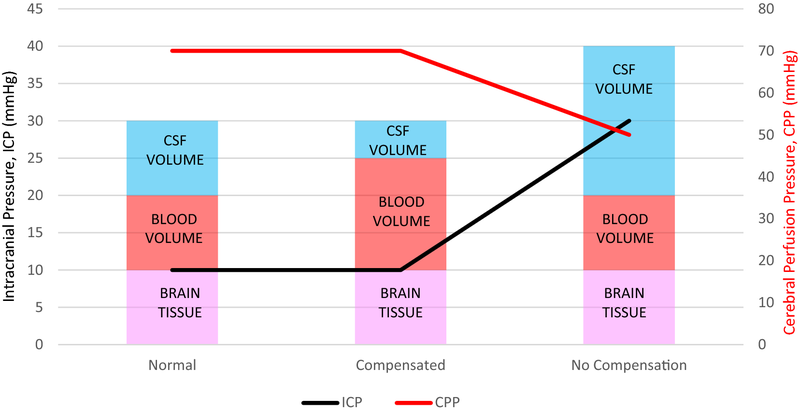 An assessment of how both ICP and CSF physiology are affected by pathology may offer us a potential target for attenuating ICP elevations in several conditions of the CNS. The blood–brain barrier (BBB), formed by endothelial cells that line cerebral capillaries connected by tight junctions, is the site of regulated exchange of ions, molecules and cells between the blood and the brain [24–26]. Fluid transport across the BBB contributes to the remaining 10–20% of CSF secretion [27–29]. Interstitial fluid (ISF) is produced by fluid secretion across the BBB [28, 30]. ISF fills the narrow extracellular space (ECS) between neurons and glia within the parenchyma, while CSF occupies the ventricles and subarachnoid space . The interaction between ISF and CSF is likely to occur in the perivascular spaces (low resistance pathways) surrounding the vessels supplying the brain parenchyma through bulk flow—which is convective in nature. It was previously demonstrated that tracers of different sizes were cleared from the brain at similar rates despite differing diffusion coefficients. These observations imply convective flow, as they are inconsistent with diffusive flow. It is suggested that these tracers, as well as endogenous proteins in the CSF, are distributed around the brain via a combination of convective flow in the perivascular spaces and diffusion in the tortuous brain ECS [31, 32]. Therefore, the purpose of this interaction/exchange between CSF and ISF is thought to be for the distribution of compounds from one brain region to another, like melatonin , or for distribution of compounds from the systemic circulation, like vitamin C and folate entering the CNS via the choroid plexus [31, 34]. CSF can flow into these perivascular spaces from the subarachnoid space via pores, termed stomata, in the penetrating arteries . Here, both fluids interact and may flow back into CSF compartments to be drained via the major CSF drainage pathways. The concentration of potassium in the ISF in the mammalian brain increases measurably (3–4 mM) during physiologic stimulation, to a larger extent (up to 12 mM) during seizures or direct synchronous stimulation of afferent pathways, and to exceedingly high values (> 30 mM) during anoxia or spreading depression. In spite of these rapid and large changes in extracellular potassium (Kout), values return to normal levels in a relatively short time. Neuronal excitability is regulated by a complex interaction of excitatory and inhibitory potentials. In pyramidal neurons, depolarising ion conductances involved in fast action potential generation are regulated primarily by the voltage-dependent activation/inactivation properties of Na+ and K+ channels; in addition, inward Na+ and Ca2+ currents underlie the generation of excitatory postsynaptic potentials (EPSPs). Termination of these depolarising potentials occurs by the voltage- and calcium-dependent activation of potassium conductances and by the activation of interneurons that release inhibitory neurotransmitters to produce inhibitory postsynaptic potentials (IPSPs); the latter are mediated by postsynaptic activation of chloride and potassium currents. Although excitatory events are under physiologic conditions, relatively independent of modest changes in the driving force for the permeant ions, both repolarising potassium and K-IPSP conductances are critically affected by even modest changes in cell resting potential (resting membrane potential, RMP) and [Kout]. Because neuronal RMP depends significantly, but not exclusively on [Kout], the maintenance of homeostatic control for extracellular potassium plays a crucial role in the regulation of neuronal firing. Several mechanisms can explain the rapid clearance of K+ from the ISF: passive diffusion through the ISF, active removal by blood flow, and neuronal reuptake. However, these mechanisms alone are not fast enough to account for the rapid K+ removal from the ISF seen under experimental conditions. Several lines of evidence suggest that brain glial cells and more specifically astrocytes, support the homeostatic regulation of the neuronal microenvironment. This phenomenon is referred to as spatial buffering of extracellular potassium [43–45]. Local control of ion (and water) homeostasis also plays a role in determining the extent and velocity of cerebrovascular response to neuronal activation. Unlike most other organs, the supply of blood (and to some extent the venous return) is under indirect neuronal control. Whether blood vessels of small calibre (arterioles) receive direct parenchymal neuronal afferent is still under debate, but it is increasingly understood that neuronal activity controls local cerebral blood (CBF) flow by coupling of neuronal action potentials to vessel diameter by products of neural activity. Several mediators are involved, including potassium ions (increased blood flow at concentrations below around 10 mM; vasoconstriction at higher potassium levels , nitric oxide , H+/CO2 (e.g., during hypercapnia) , or by metabolic signal (e.g. adenosine or ATP [49, 50]). Dysfunction of any or all of these feed-forward mechanisms of neurovascular coupling are involved in a broad range of neurological diseases [51–53]. In addition to local control of CBF, the brain is characterised by an additional “anomaly” when compared to peripheral organs. 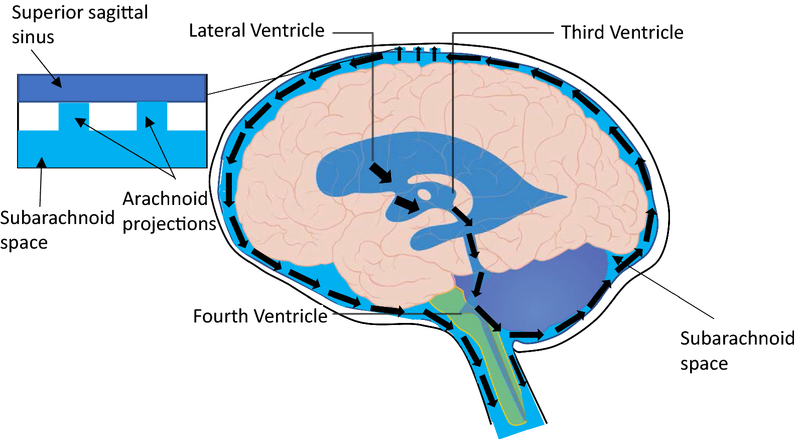 This brain-specific vascular feature impacts several of the issues currently debated (see “glymphatics” below and [30, 31, 54–57]). In the peripheral vascular system, the management of fluid movement across the capillary wall is achieved by a synergistic combination of transcellular and paracellular pathways. Endothelial cell membranes outside of the brain (except in the circumventricular organs), in addition to being permeable to water and gases, express aquaporin 1 (AQP1) water channels . AQP1 is the dominantly expressed aquaporin in peripheral endothelial cells. However, apart from the endothelium in the kidney, the physiological importance of the expression of AQP1 and high water permeability remains undetermined . The interendothelial clefts, fenestrae, or gaps may be the anatomical substrate of the paracellular pathway. Ion transport at the choroid plexus epithelial cell is depicted in Fig. 2. Briefly, at the basolateral membrane, the net movement of Na+, HCO3− and Cl− into the choroid plexus epithelial cell is essential and is driven by the Na+ gradient. This gradient is utilised by Na+–HCO3− cotransporters (NBC) to facilitate the accumulation of HCO3− in the epithelial cell. 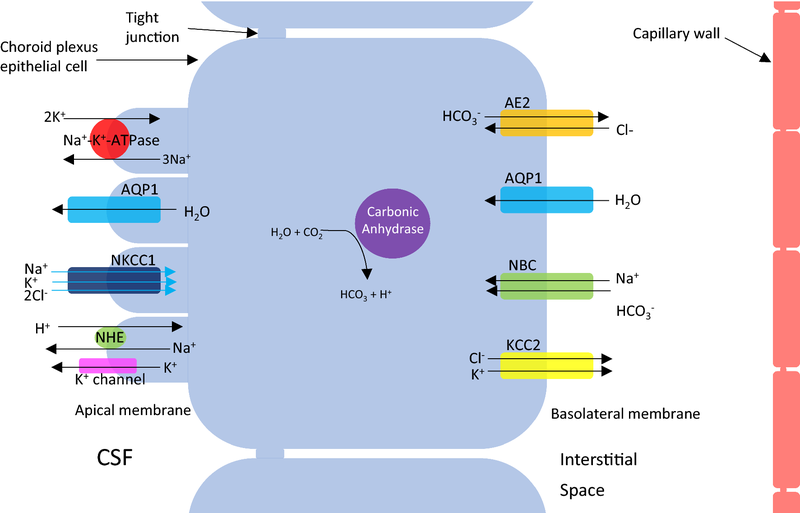 Carbonic anhydrases within the cell also contribute to this accumulation by catalysing the production of HCO3− and H+ from H2O and CO2. The resulting HCO3− gradient drives Cl− transport into the cell by the epithelial anion exchanger 2, AE2. Simultaneous to the events at the basolateral membrane, transporters at the apical membrane operate to move Na+, HCO3− and Cl− between the epithelial cell and the CSF. This involves the actions of the Na+–K+-ATPase pump and inward-rectifying anion currents. The involvement of Na+–K+–2Cl− cotransporter (NKCC1), expressed in the apical membrane of the choroid plexus is under debate; however, some studies have demonstrated that bumetanide, an NKCC1 inhibitor, reduces CSF secretion at the choroid plexus epithelium [67–70]. Recently, further evidence has emerged to support the involvement of NKCC1 in CSF secretion independently of osmotic driving forces. Steffensen et al. have demonstrated using both ex vivo and in vivo studies on mice that NKCC1 contributes to approximately half of the CSF production by cotransport of water along with its directional translocation of ions independently of an osmotic gradient. In addition, in a rat model of post-haemorrhagic hydrocephalus, NKCC1 was hyper-activated by inflammatory markers in the CSF, and caused bumetanide-sensitive ventriculomegaly . One study proposes that some of the inhibitory actions of bumetanide, a drug thought to act on NKCC1 channels, occur through inhibition of AQP1 at high concentrations. Using Xenopus laevis oocytes, they demonstrate that a derivative of the bumetanide compound, AqB013, can inhibit both AQP1 and AQP4 channels with high affinity, confirming the water channel as the site-of-action by targeted mutagenesis . However, a recent study could neither replicate the effect on AQP4-mediated osmotic water permeability by AqB013 and bumepamine nor the bumetanide’s inhibitory action on AQP4 in a rat oocyte assay as reported by Migliati et al. . Yool and colleagues subsequently tested the blocking potential of additional bumetanide derivatives on AQP1 channel conductance and demonstrated attenuation in cancer cell migration upon administration of AqB007 and AqB011 ; however, the blocking actions of these derivatives on AQP1 have yet to be demonstrated by other groups, and therefore, their potential actions on CSF secretion remain unknown. Increased intracranial pressure is reported as a symptom or complication in several CNS pathologies like hydrocephalus [2, 107], IIH [108–110], TBI , intracerebral haemorrhage (ICH) , subarachnoid haemorrhage (SAH) [26, 113, 114], and ischaemic stroke [115, 116]. A comprehensive review of altered CSF dynamics in each of these CNS disorders would be beneficial; however, the depth required is outside the scope of this review. Instead, this section will briefly outline CSF dynamics in CNS disorders with an extended focus on literature regarding altered CSF dynamics in the context of ischaemic stroke and SAH to reflect the research interests of the authors. The involvement of CSF in elevated ICP following SAH is yet to be fully defined. However, some clinical observations have reported disruptions to CSF flow associated with SAH [131–134], and studies of animal SAH models support these observations [101, 135]. Disruption of CSF flow along the ‘glymphatic’ pathway was shown following SAH by comparing the distribution of tracers injected into the cisterna magna; this disruption was sustained for at least 4 days with improved distribution at 30 days . The authors proposed that this attenuation in CSF flow was tissue-factor (TF) dependent; however, a causative relationship could not be determined as increased haemorrhaging in the presence of TF antibodies dampened the fluorescent signal of the tracers. Additionally, ICP was increased within 1-min of SAH, reaching a maximum of 290% of the baseline. The elevation was reduced but sustained at 1-h post-stroke, at 151% of the baseline. This review summarises our current understanding of CSF dynamics with a focus on effects on ICP during neurological diseases, and highlights some of the discrepancies within the field. The implications of such findings are of high clinical relevance for understanding and treating neurological diseases where brain fluid homeostasis is impaired. Our efforts to elucidate the regulators and mechanisms involved in CSF secretion are still ongoing. Some evidence suggests the involvement of AQP1 at the choroid plexus , and more recent discoveries implicate the molecular transfer of water via NKCC1 in CSF secretion ; these insights may provide targets for therapeutic control of CSF in conditions of excessive secretion and elevated ICP. Regarding CSF drainage, the conventional view of transport into the superior sagittal sinus by arachnoid projections is challenged with evidence of the involvement of extracranial lymphatics [14–18]. Other hypotheses of CSF drainage have been proposed but are currently criticised within the field. Inhibitors of CSF production, like acetazolamide, are widely used in clinic for lowering ICP, and animal studies have demonstrated their ability to decrease ICP in rats [153, 154]. However, their efficacy in humans is controversial with some reporting attenuated symptoms of elevated ICP in IIH patients prescribed acetazolamide , and others reporting that weight loss was more efficacious than acetazolamide . Further, a recent Cochrane review concluded that there is currently insufficient evidence to support or reject the clinical use of acetazolamide in treating symptoms of elevated ICP in IIH . Recent evidence suggests a role for AQPs, TRPV4, and NKCC1 in CSF production. Determining the exact role of these proteins in modulating CSF dynamics and the resulting influence on ICP offers potential to identify therapies that are of translational value. This is extremely important as ICP elevation can lead to secondary neurodegeneration after insult/injury, and in some cases, can even be life threatening.